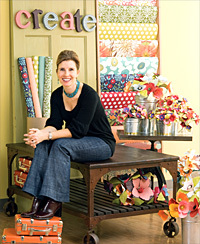 Sally Pofcher '94 often elicits a merry response of "I love that store!" from people when she tells them that she's the CEO of Paper Source, a Chicago-based retailer of fine papers and craft supplies. It's easy to see why customers are enthusiastic about the company, which counts 29 stores in 12 states and Washington D.C. A visit to the bright and friendly Evanston Paper Source presents a homey feel and cheerful merchandise. Colorful papers, custom-made stationery and unique stamps fill the storefront, inspiring passersby to take a second look at the charming designs. Pofcher knows firsthand the feelings that the company evokes in its customers. While earning her Kellogg MBA, she often shopped at the retailer's River North location for her craft projects, even using Paper Source materials to make her brother's wedding rehearsal dinner invitations. Pofcher's genuine love for Paper Source is apparent during a tour of the Evanston location, which she calls her "home store" because of the short drive from her Wilmette residence. As Pofcher shows off the store's gift wrap and decorative paper, ranging from an elegant flora/fauna design to a festive arctic penguin pattern, she reveals the intention and stories behind each selection. "Paper Source evokes something really different in people," Pofcher says with pride. "You can experience it while walking around the store. People are doing things that are very personal and individual. It's sparking creativity. It's a wonderful thing to be associated with." In fact, this association is even embedded in the company's motto: "Do something creative everyday." The Kellogg School provided the opportunity and education that elevated Pofcher's career and led to her becoming a CEO, she says. Prior to attending Kellogg, she was an unhappy banker who wanted something more out of her career than just crunching numbers. As a result, Pofcher spent 10 years at McKinsey & Co. after graduating from Kellogg, consulting for national retailers and imparting her expertise on matters such as location selection and merchandising strategy, among other things. Leaving McKinsey at the partner level, she spent two years at The Gap Inc. as senior vice president of brand strategy and business development. Pofcher and her family were living comfortably in San Francisco when Paper Source called via an executive recruiter. In 2007, she was named the company's CEO by private equity investment firm Brentwood Associates, which had acquired Paper Source from the founders that year. In addition to overseeing retail, Pofcher is in charge of the company's direct-to-consumer and wholesale divisions, which make up 20 percent of Paper Source's business. Since being named CEO, the Kellogg alumna has focused on building the company's operational backbone while being careful to retain the "unique soul" of Paper Source's creative culture. Pofcher says that she has done that by integrating new talent with the current staff, holding employees to performance goals for the first time and establishing operational metrics and processes. As many retailers struggle with a massive slowdown in sales and growth, Paper Source is taking advantage of the situation by locking in long-term leases with landlords and leasing owners desperate to find tenants. The company opened eight stores in 2008, including Atlanta and Portland, Ore. Eventually, Paper Source plans to have 200 retail outlets. "The economic benefit of this downturn lives with us for a long time," says the Kellogg graduate. "Growth is just a matter of our degree of conservatism and how we fund it." Indeed, it's a challenge that requires Pofcher herself to "do something creative every day." "Every part of what I've done [at Paper Source] has been satisfying," Pofcher adds. "It's really fun to build a team in an environment where you can set the tone of the culture. I may never have a job that I will like as much as this job in my life."